There has been a lot of time spent processing goodbyes in our household. Goodbyes are painful, whether we spend months preparing for them or get a phone call that they're happening in an hour. Goodbyes are one of the first things people think about when they hear "foster family", and their impact lasts a long time, so we've talked about them a lot. But as we're gearing up to launch back into foster care in the next couple of months, I want to take a moment for the hellos. Our hello moments didn't have people ready with cameras for family photos and first moments together. There weren't balloons or flowers. The pictures we do have had to remain private, and we couldn't share names or details of why our children came to us or what they had experienced. The days and weeks after a placement involve many meetings and appointments, lots of trial and error, and then the straightforward exhaustion of sleeplessness with little babies. Most of the stories, images and memories from those first days with each of our children have remained within our own household. So I want to talk about the hellos now, before we're back in the midst of the chaos. About the beauty, excitement and tragedy of bringing home someone else's baby. Those moments of answering the phone and finding out that it's one of those calls are full of adrenaline and excitement. Shaking hands, running around trying to find note paper, but writing on a scrap or an envelope instead because everything is happening quickly. Not much information - maybe a birthday, a name, a race, some background information. Trying to jot down every detail and carry on a conversation, all while trying to make the major decision of whether or not to make this child a part of my family. Asking questions, knowing the odds of getting answers are slim - and the odds of getting correct answers are even more slim, because again, no one has very much information, and sometimes what little there is isn't deemed important for the foster parent (we can talk that one over another time). Even the few details we get have to be taken with a grain of salt - birthday, parent history, even a child's name, can all be wrong in those first phone calls. All this happens while the situation is still up in the air. I remember the day Big Brother A and I got a call for a 10-month-old baby boy while we were at the beach. I still can't believe that I heard the phone ring from the water. They would let me know by 4:00 if R came into care. They didn't, and he didn't. I still pray for that baby. The hello never happened, but just knowing he was there made a place for him in my heart. I will forever pray for him by name. Even that whisper of a hello is a beautiful privilege. Our very first foster baby hello. The first baby who did come... The first call after three months of certification. That baby was already in care. That situation was different than many, because he was in an emergency foster home. He was clean. He was dressed in clothes that fit, that weren't stained. We knew when he should eat next and what kind of formula to use. We knew his age, his name, his situation. The next day, we found out that the situation wasn't what we'd been told, and he left. But the hello was beautiful. Soaking in a new little person. Knowing that in ten days, he'd lived in four places. Wanting to show him what love looks like for as many days as we had. Treasuring him, even when he wouldn't sleep at night, because he needed to be treasured, because he needed to know what home feels like. Josh and I sitting next to him at 4 am, awed by the beautiful details in his perfect little toes and fingers, trying to learn his face and ears by heart, stroking his sweet, soft hair. Beautiful hello. I packed his going-home bag. Four months old, but to us, the outfit I picked would be his first. The day he came home would be the day he joined our family. This was my first medically fragile child. I didn't have a clue how big he'd be or what his needs would look like, but I was ready to learn. I had to leave my husband and Big Bro A at home, because the situation wasn't safe for Big Bro. This time we wouldn't all meet the baby at once. The feeling of wandering into the hospital to pick up a baby - surreal, exciting, nerve-wracking. I learned that there's a social services room in the hospital. I was brought to my little Baby Z and left in his room while logistics were sorted out. A nurse came in to introduce us, showed me the baby, and asked if that was who I was there for. I didn't even know his race; I couldn't have told her if it was the wrong baby! How quickly can you bond with a baby if you're not sure it's the right one yet?? Beautiful baby; uncertain hello. I remember getting information overload on how to care for this special baby, and asking them to write it all down for me. There were discharge papers I wasn't allowed to sign because I wasn't his legal guardian. A county worker was there for that. I was amazed at how much the hospital staff LOVED my baby. They had nicknames for him. They knew what he liked and didn't. Some told me memories of their weeks with him, and that they would miss him. If I had known how loved he was already, I wouldn't have felt quite as sad about having to wait one more day to meet him. Being in the hospital did not mean he was alone. I wasn't allowed to carry him to the car. 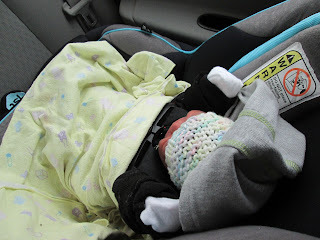 I wasn't even allowed to use my clean, safe, sturdy infant carrier carseat. I had to place him in the dirty, broken infant carrier with the strap only on one side from his birth family, "so he would stand out less". I was escorted to the parking garage by security people, who checked around corners and inside elevators for the relative who might attack if she saw me with her baby. A nurse pushed a hospital cart full of beautiful new items people had given our little guy so he'd have his own things. They left me in the parking garage, hoping I didn't find out what baby's relative looked like by meeting her face to face! I switched him to our carseat and loaded the trunk: our diaper bag; beautiful donated items that were just oozing with the love of many different people; and the not-so-nice things his family had brought to the hospital with him, never anticipating that they would be going home with someone else - that their baby would be going home with someone else. I brought him upstairs to our apartment, where he met my husband and son for the first time. That was beautiful. Another beautiful hello. Even the evil cat came to sniff sweetly at his tiny, gorgeous little curls. Beautiful moments, all ours. No family pictures, just snapshots of one or another of us getting to know this precious boy. Beautiful pictures that we would look back on after he left in two weeks, amazed at how much change had already happened. Dry skin was smoothed; cracked and rough hands were healed. His thin face had rounded out; his sad and lonely cry had been replaced by a smile and the most beautiful baby giggle. Joyful boy. And the third baby. Big Brother A and I were out getting groceries, and I got the call in the checkout line at Wegmans. I rudely took it, and I'm so glad I did! So I was putting groceries on the checkout belt, trying to remember all the information coming from the homefinder with no ability to write it down, and feeling so rude about ignoring the cashier. In the meantime, Big Bro decided he wasn't getting enough attention and opened up a box of elbow macaroni and dumped the ENTIRE box on the floor! So we had the cashier, the kind maintenance person, the person getting our new box of pasta, a cranky 2-year-old, and me still rudely on the phone! They were, of course, very courteous and forgiving, because Wegmans customer service is awesome. Such a memory! That call was a probably-later pickup. We went out as a family to have lunch together, and we got the definitely-come-now call right after lunch. All of us went together that time. We went to a county building, the same one we'd visited for our goodbye with Baby M. We parked in the loop. I got out of the car and walked up to the door with an empty baby carrier. I waited for a few minutes with the people who were loitering outside. Then a case worker came down with a baby, a toy, and a diaper bag. I vividly remember thinking it was a little inappropriate for the random person sitting on the stone wall next to me to say "oh, he's going with her? I'll take him!!!" and how shocking it was that they just handed me the baby and his things without any ID or signatures (I hope they looked up my face in a file somewhere first!). And then I latched the infant carrier in the car, and we drove away, with a new baby that two people in the car hadn't even looked at yet! We had our moment of introduction at home, alone. Sweet and beautiful. Another hello. Hellos for us are blurry text pictures to family and close friends, family movie nights and frozen pizzas. Hellos are trips to Wal-Mart where well wishers congratulate me on how skinny I am for having such a young baby and then give my husband and I very puzzled looks when they realize how very white we both are! Hellos are new clothes that a baby never gets to wear, that become sweet hopes packed away for another baby who might come some day. Hellos are wondering if this baby has had a bottle before. Did they nurse? Is their mommy still healing from delivery? Is she okay? What is she thinking and feeling right now? Does their daddy even know? Are there siblings missing this sweet babe? What does his new sibling think of him? Is this the first day of forever, or one in a numbered set? Hellos are taking pictures of every moment and every first, even though it's just a first for us, because maybe we'll be the one making a baby book for that little one. Maybe this will be the story we'll tell our child someday. Maybe we'll have the privilege of sharing their forever as friends, even if they aren't in our home. Maybe we'll be able to send a CD of pictures with them when they leave so that this chapter of their lives will be beautiful and loving, not blank and unknown. Maybe we will have the ability to give bio family glimpses of the precious moments they missed. The joy and anticipation of the hello is something beautiful. It is something I can look forward to even in the midst of the hardest goodbye. I have learned that hello doesn't lose its beauty. And while the uncertainty of the future is painful, I can say with certainty that there will be more hellos when the time is right. The hellos and the in-betweens are well worth the goodbyes.